Peter Huttlinger's amazing guitar technique didn't just happen. He developed it over the years, enhanced by good practice and exercise regimens. As a guitar teacher with more than sixteen years experience, Pete knows that the most important thing that players need is guidance in their practicing routine. He has seen guitarists playing a piece for years, making the same mistakes over and over without knowing how to fix the problem. Now, with this powerful lesson filled with invaluable advice and insider's tips, you can increase your guitar skills and perfect your playing style through proper practice routines. You'll learn how to isolate the problem phrases in a piece of music, use a metronome to build solid rhythm, increase your picking speed (flatpick or finger style), train your "muscle memory," and, perhaps most importantly, learn how to manage your practice time for sure results. Pete provides numerous scales and exercises to help you gain fingerboard knowledge, strengthen your fingers and develop right and left hand coordination. Finally, you'll put it all to practical use by learning to conquer a dazzling instrumental, The Monaghan Jig, taking it apart phrase by phrase using Pete's practice method. This is a lesson that will benefit all guitarists. Whatever level you are starting from, you'll see the quality of your playing grow by leaps and bounds, and you'll get more pleasure from your music making. "The idea for this lesson came about after years of giving private guitar instruction. People love to play music, and the guitar is probably the single most popular instrument to play. And why not? It's relatively easy to get started, it's portable (you can take it anywhere), but mostly it's just plain fun. However, after learning a few favorite songs or a cool riff we remember from our childhood, most of us want to improve and get to the next level. The biggest hurdle I ran into was that students didn't really understand how to practice. They knew what to practice but the how was always the real problem. Manytimes I'd sit in the room with them and spend the entire lesson actually practicing along with them. Every time I did that they would leave the room a better player than when they entered - all because we practiced hard together. Hopefully, you will take the ideas, exercises and pieces that I teach in this lesson and apply them to your own playing. If you do, you will see amazing results. Enjoy! Pete"
The late Pete Huttlinger was widely known as one of the most awe-inspiring acoustic guitar players in the world. His unique arrangements and spell-binding musicality and precision entertained audiences from Los Angeles to Milan. 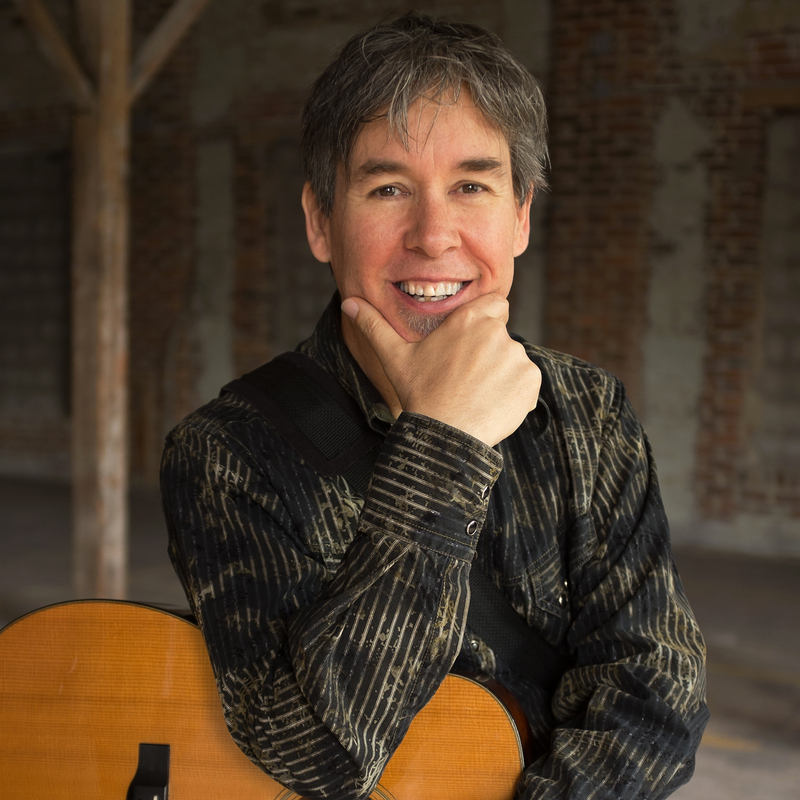 As a recording artist Huttlinger released numerous albums and received wide-acceptance ranging from his critically acclaimed Naked Pop continuing to his instrumental tour de force, McGuire's Landing. In 2007, Huttlinger made his debut at New York City's Carnegie Hall. He was invited back in 2008 and made his first appearance there as a solo artist demonstrating what audiences around the world knew him best for - his fantastic sense of humor and mind-blowing chops. He performed there again in 2010. In 2004, 2007 and 2010, he was invited to participate in Eric Clapton's Crossroads Festivals. In addition to his concert touring schedule, Pete spent a good deal of his time on stage speaking to audiences. He had taken what he learned from surviving both a major stroke and end-stage heart failure and turned it into "Don't Just Live, Live Well," a presentation on how he has overcome what seemed to be insurmountable obstacles. Pete also made many appearances as a side-man. Country/pop superstar LeAnn Rimes has often requested him for her acoustic performances, including the filming of "Live From Abbey Road," a BBC TV series taped at the famous London studios. It aired in America on BRAVO! He also appeared with Rimes on ABC's "Dancing With The Stars" and made an acoustic recording with her. He toured with John Denver for the last four years of John's life and often toured with pop icon John Oates of Hall & Oates. Sadly, Pete passed away on January 15, 2016.